Brides have many important decisions in their wedding planning including how to make their Maid of Honor shine a little brighter than the rest of the bridesmaid party. Making your Maid of Honor stand out shows her just how special she is and makes sure everyone else knows it too! Read on for some tips from House of Brides Couture! Do you want your bridal party to be uniform with a subtle twist for your Maid of Honor? Let her choose her own dress style in the same color as the rest of your bridesmaids. We love the pairing of Bill Levkoff style 1511 and 1512. 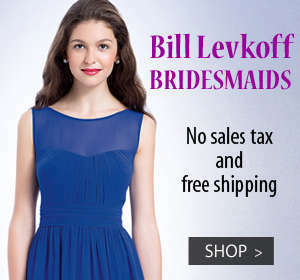 Both styles share the same trumpet skirt in satin but feature different necklines. Let your Maid of Honor choose a hue all her own while still complementing the rest of the maids. Opt for colors in the same color family or palette in varying shades for the prettiest effect. House of Brides Couture adores muted pastels. Try blending Mori Lee Bridesmaids style 21551 in ethereal Sea Glass with style 21552 in dreamy French Lilac. 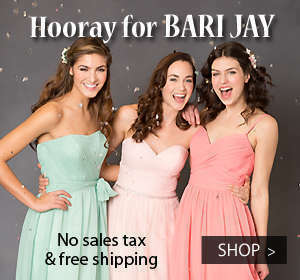 Go for bold and really make your Maid of Honor shine in a sequin dress! A sparkly style makes a statement and calls a little extra attention to the girl who wears it. We can never get enough bling! We especially like the all over sleekness of Watters Maids style Lucette and the Hollywood glamour of style Elson. Show your Maid of Honor a lot of love with these style tips! Or create your own special look for your bestie! Feeling inspired? Shop our bridesmaid dresses online or click here to find a House of Brides Couture location nearest you. Our experts can help find the perfect Maid of Honor pairing for your bridesmaid party!